Marine systems are characterised as highly complex, being subject to multiple drivers (e.g. climate change or fishing pressure) and being riddled by high uncertainties. Yet, we still manage to come up with models to simulate ecosystem dynamics or establish fishing quotas. In order to achieve this we rely on experts and their judgements. Especially in situations where empirical data is scarce experts are often the best or even only source of information. Experts help to make sense of ambiguous data or, in case of no data, are able to provide input due to their acquired learning and experience. These expert judgments are indispensable but it pays to be aware that they are not perfect. While the idea that people are not always rational agents has been widely accepted, it is often overlooked that experts are humans, too. The diversion from perfect rational behaviour is called a cognitive bias which often is a subconscious process. There is a vast diversity of cognitive biases which can be seen in figure 1. Out of these biases some are more and some are less likely amongst experts. 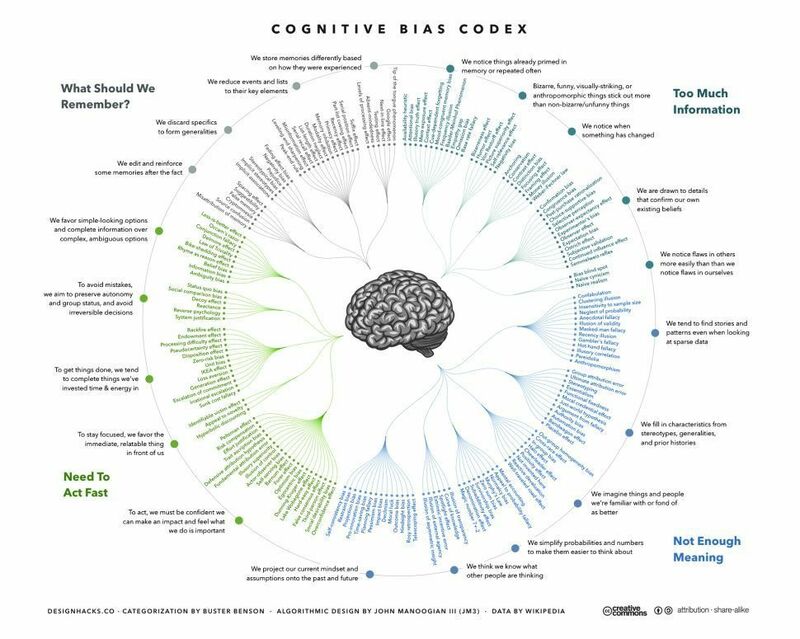 The most often encountered cognitive biases among experts are overconfidence, anchoring, adjustment, accessibility, the desirability bias, and confirmation bias [1, 2]. The overconfidence bias often occurs if more data is available, if there are no regular systematic feedbacks or if the future is hard to predict. This bias is more common among experts than the average population as experts, per definition, know more in their field than most but overestimate exactly how much more. Anchoring and adjustment biases arise if expert judgement is influenced by the first information received or e.g. on previous estimates. The adjustment bias arises if anchoring prevents the correct adjustment of the estimates. Accessibility bias, also known as availability bias, occurs if information that comes easily to an experts mind disproportionately influences the judgement. It might even lead to ignoring potential alternatives completely if there is one possibility that is most prominent on the experts mind. The desirability bias can work in two directions. Either, higher probabilities are assigned to outcomes which are desirable (desirability of positive event bias, also known as optimism bias or wishful thinking bias), or lower probabilities are assigned to undesired outcomes (undesirability of negative event bias). The latter one often arises if the expert aspires to provide a conservative estimate as is often the case in environmental risk analyses. The last major bias in experts is the confirmation bias. This bias refers to the human trait of assigning higher importance or quality to information which is in line with their previous beliefs. An example is the discovery of black swans. Every white swan confirmed the firmly established belief that swans are white. The mentioning of black swans lead by some people to simply ignoring this new information (confirmation bias) while others declared that people who claimed to have seen a black swan were mentally ill, exhibiting a very strong Semmelweis reflex (rejection of information which is not in line with previous beliefs). If you caught yourself thinking it was obvious that there can be black and white swans you experienced a hindsight bias (also known as knew-it-all-along bias). Given the importance of expert judgements in marine management it is worthwhile exploring which biases are deployed, of which magnitude they are and work on strategies to reduce them. One of the biggest accumulations of expert knowledge in fisheries management are stock assessments. Since they are the backbone for marine management we are currently analysing in how far they are influenced by expert biases. McBride, M. F., Garnett, S. T., Szabo, J. K., Burbidge, A. H., Butchart, S. H. M., Christidis, L.,Dutson, G., Ford, H. A., Loyn, R. H., Watson, D. M. & Burgman, M. A. (2012), `Structured elicitation of expert judgments for threatened species assessment: a case study on a continental scale using email', Methods in Ecology and Evolution 3(5), 906-920. Montibeller, G. & Winterfeldt, D. (2015), `Cognitive and motivational biases in decision and risk analysis', Risk Analysis 35(7), 1230-1251.